Come participate, spectate and support the first ever Winter Beer Sprint Series in NE Wisconsin! 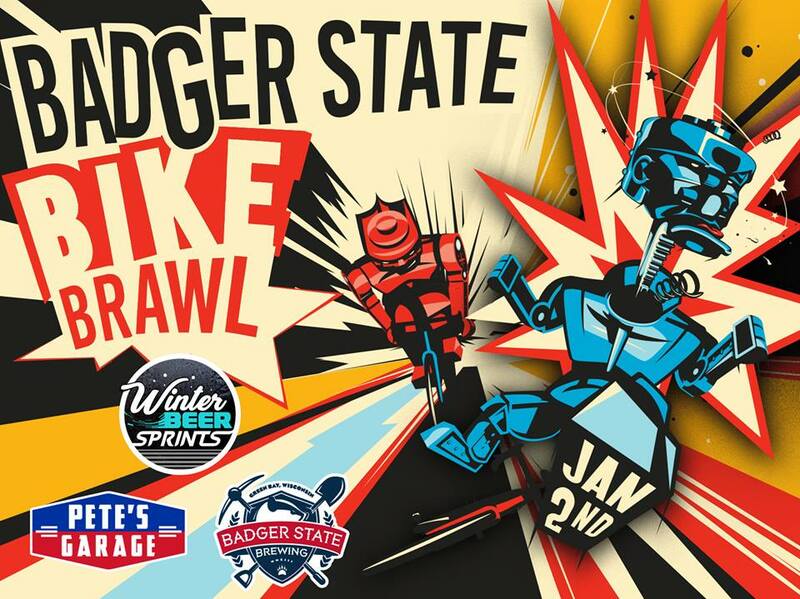 Pete’s Garage has partnered up with Hinterland, Titletown Brewing Co., Badger State Brewing Co. and Copper State Brewing Co. to present and host an exciting Goldsprint bike race series. This is a race where anyone who can sit on a bike saddle and turn over cranks can enjoy time spent in an energized atmosphere that only an indoor bike roller race can provide. Pete’s Garage Racing is hoping to give everyone a chance to have a little fun while participating and/or watching this inaugural event that will help promote the sport of cycling and in addition, help the under-served youth in and around the Green Bay area to get quality bikes that might not otherwise be possible. Pete’s Garage Racing is a non-profit organization that invites you all to help us in our mission while supporting us and our area’s fine breweries on Tuesday nights starting January 2nd at Badger State Brewing Co. After the first event, we’ll move on to Copper State (1/16/18), Titletown Brewing (1/30/18), and then Hinterland (2/13/18), all at the same time and day of the week. Each event will be able to accommodate 30 participants and the cost is $20 per entry, which includes a free beer from the brewery. There will be prizes to be won at each event from the brewery that’s hosting and from Pete’s Garage, too. There will also be points accumulated throughout the series for all the participants, and the one with the most points at the end of the series will win a grand prize of a custom track bike custom tailored to the winner’s measurements compliments of Enclave Cycles. Pete’s Garage will have the overall winner come in the shop and will help find the perfect fit using their GURU Fit bike. The bike will then be built according to the desired fit. How cool is that!? So come out and join the fun, enjoy beer, food and something new and exciting here in Green Bay! We hope to see you out there. If you have questions about the event, please feel free to contact Derek at the shop. His email is derek@petesgarage.com. He can help with any questions you might have about the event.